Today’s picture is ‘Set The Bar(re)’ and perfectly suited to today’s crossfit WOD which was a benchmark for me. I did ‘Helen’ (400 metre run, 21 Kettlebell swings, 12 pullups) and I got that done in 9:40. 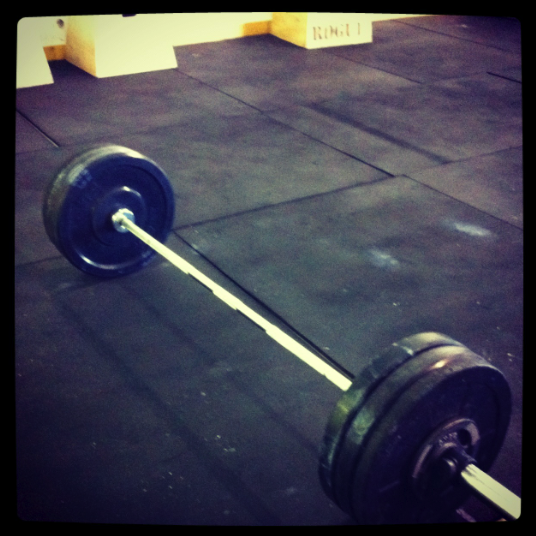 Then I worked on getting up to my 1 rep max in the dead lift and I ‘set the bar’ by surpassing my body weight. My 1 Rep Max ended up being 185lbs!!!! The picture below is 175lbs but after that I had an audience and was too shy to pull out my iphone like a dork and take a picture of the weights.